Prosecutors Agree To Drop Assault Charges Against Former Cleveland QB Johnny Manziel : The Two-Way Dallas County prosecutor agreed to drop assault charges against the former Browns quarterback, as long as meets conditions such as attending an anger management course and a substance abuse program. 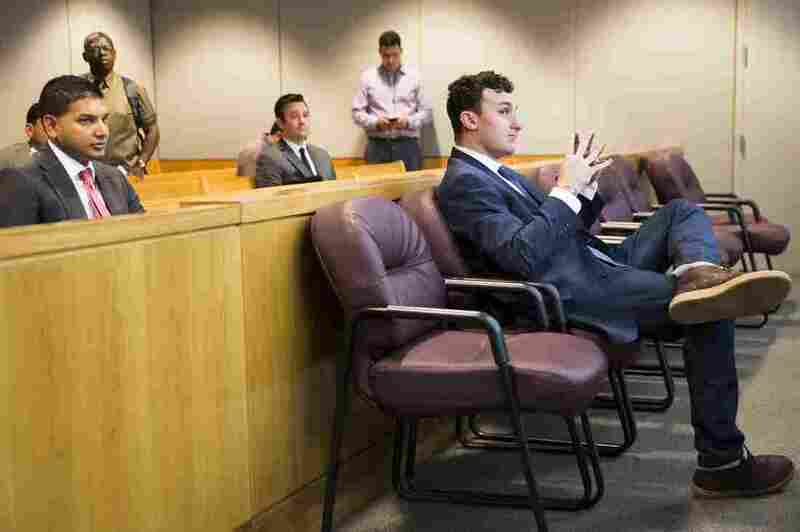 Former Cleveland Browns quarterback Johnny Manziel sits while his defense attorneys confer with the prosecution during his initial hearing in May 2016 in Dallas. The Dallas County District Attorney has reached an agreement to drop assault charges against former Cleveland Browns quarterback Johnny Manziel, as long he as meets conditions such as attending an anger management course and a substance abuse program. Manziel's former girlfriend Colleen Crowley "has accused him of hitting her and rupturing her eardrum in January," as The Two-Way reported. He was indicted in April on a misdemeanor charge of assault that caused bodily injury, a charge that "carried a penalty of up to a year in jail and a $4,000 fine," according to The Associated Press. "Complete Anger Management Course Approved By Court"
"Attend Domestic Violence Victim Impact Panel"
"Participate fully in the NFL's Policy and Program for Substance of Abuse, or if program is unavailable, Drug and Alcohol Rehabilitation at Court Approved Location." "No Contact with Complainant Colleen Crowley." "The Defendant's progress will be monitored by the Dallas County District Attorney's Office and upon successful completion of these new conditions within the next 12 months, and if the defendant commits no new offenses, the District Attorney agrees to dismiss the case," the agreement states. "The judge overseeing the case will still have to approve the dismissal agreement," according to The Dallas Morning News. Prosecutors tell The Associated Press that the process is not over. "A conditional dismissal is only the beginning of the process of educating an individual on how to make better choices when facing conflict," prosecutors tell the wire service. "It is an important first step for a defendant. Success or failure will depend upon one's commitment to the treatment programs included." "Earlier this week, a bar employee in Austin sued Manziel in a Travis County court and accused him of punching him and breaking his nose. Austin police are investigating the alleged incident. It is unclear if Manziel will face any charges in that case." Manziel won the Heisman Trophy while playing at Texas A&M University, and as we reported, "his career has been marked by reports of substance abuse and time at a rehab facility."